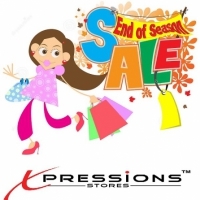 n Flat 15% on other items..
visit Xpressions store 13th n 14th April..
Now Get FLAT 50% Discount on Kids Winter Garments & Gents Winter Garments & Flat 40% on Ladies Shoes Entire Stock..
Hello friends! Tarzz FLASH SALE offering FLAT 51% OFF on everything in Xpressions store Mardan. Xpressions Store Final Winter Clearance SALE IS LIVE! Save upto 50% off on entire stock till stock last. Most of the items are on flat 30% & Flat 40% off. Last Day of New year Sale at upto 40% OFF on entire winter range, starting from 21st December till 31st December.